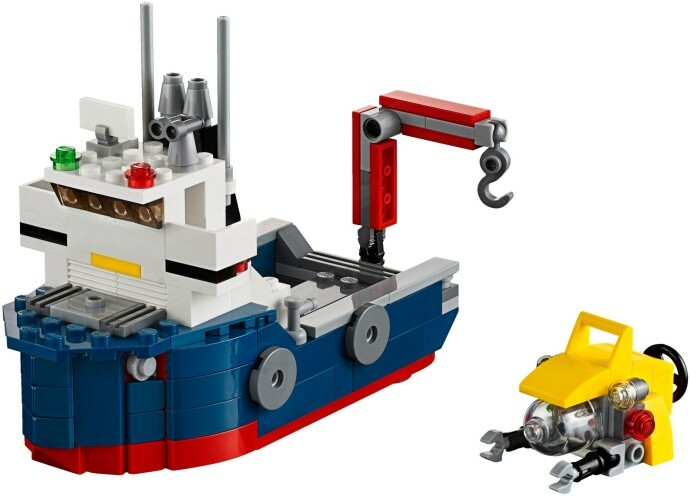 Wandering the Internet not long ago I saw a LEGO set that I thought my kid would like because it had a hook (they are into tow trucks these days, so things with hooks catch their interest). Unfortunately I didn't bookmark the page nor write the name of the set down, and now it is impossible for me to find it again. It was probably a LEGO creator set, because at first I thought the box contained 3 different vehicles and then I realized that you could build 3 different things with the same pieces. It had a hook of some kind (definitely) and probably a rope for the hook. One of the vehicles that you could build with the set was airborne, probably an helicopter, maybe a train. Other of the vehicles that you could build was a boat or ship (due to the size it looked more like a tiny tugboat). The predominant colors in the set were red and black (maybe dark blue?). Note: I don't think it was the LEGO Creator Cargo Heliplane. What set is this remote from?